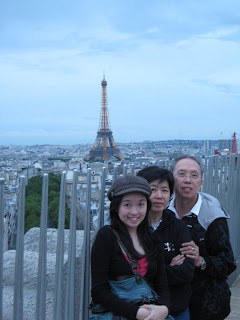 As this was my first visit to Europe, Paris was inevitably one of the choice locations to visit. Staring from London, we moved on to Paris via the Eurostar. The tickets are cheaper if you book in advance. If you book from the Eurostar website, you get to choose seats. If you're traveling in a group, it would be nice to select seats facing each other with tables in the middle for you to have your meals. There is a cafeteria in the train but we bought food at the St Pancras Station and ate on the train. The Eurostar arrives in Gare Du Nord, so if you are looking for a hotel you should consider one near the Gare du Nord or any one which is near the metro stations. To move around in Paris, the metro would definitely be the best mode of transport as the metro stations are everywhere in the city. We used the Paris Visite Card which costs 20 euros for 3 days. It is definitely much cheaper than buying trip tickets because you'll be using the metro a lot. Another option would be to get the day pass. It depends on your itinerary. You can also get 20% discounts on certain entrance tickets including Arc du Triomphe and the Pantheon.We arrived in Paris in the afternoon, checked in at the hotel and still had time to go sight seeing as sunset is 9 something. Our first stop was Place de La Concorde. A very common sight in many parts of the park and also in other parts of Europe. and also walk across to the Louvre. Next, we went to Arc du Triomphe . The climb up the stairs can be tough for some people, but the view from the top is worth the trouble. And there are many interesting exhibits inside. From here you can stroll along Champ Elysees. The good thing about visiting Paris on your own is that you get to see the places at different times of the day. On our first day we enjoyed the evening and night view of Eiffel Tower. The best view of the famous landmark is from Trocadero. From 9pm the twinkling lights are turned on for 5 mins at every hour. On our second day, we visited many places. Starting from the famous Notre Dame Cathedral, we went to the Jardin Du Luxembourg and then walked to the Pantheon which is a few minutes walk away. The inside of the Notre Dame and the Pantheon is a sight to behold. The Pantheon is in the Latin Quarter where the Rue Mouffetard Food market is. You can have lunch at the many restaurants in the area or get some pastries and sandwiches from the bakeries there. After lunch we went over to Eiffel Tower. You can pre-book tickets online and skip the queues. The entrance tickets to the Louvre are discounted on certain days. We planned our trip to visit on Wednesday at 6 where the tickets are priced at 9 euros. I think its free for those under 26 yrs. Inside the Louvre is where you see the famous Mona Lisa painting and many other famous works. While waiting for 6pm, we hopped over to the famous La Fayette shopping centre just to check out the priceW e didn't buy anything there but took our dinner at their 4th floor. There suddenly you see so many fellow tourists..from Malaysia and Singapore, because its where you can get cheap food..McDonalds! After the Louvre, we took a sunset cruise on the River Seine. And sunset means we start at 945 pm! 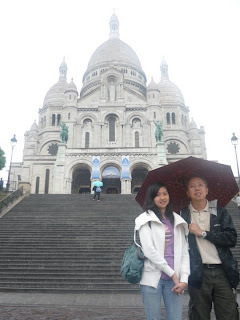 On the third day, we visited Sacre Coeur, walking distance from our hotel.But to go up the hill, we took the Funicula train. The Paris Visite Card comes with the fare. Our last destination was the Les Halles shopping area. This is where you can get real bargains. After that we headed to Gare du Bercy to take the overnight train to Rome.